NF-κB p65 protein expression levels (a) Representative immunoblot membrane; (b) Combined densitometry data of three individual experiments, indicating fold changes in the protein expression of NF-κB p65, normalized to the total proteins transferred onto the membrane. 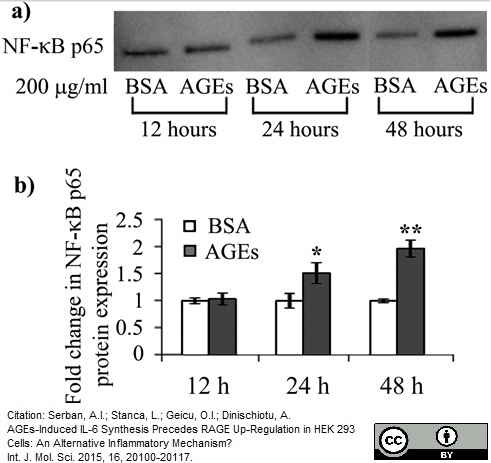 BSA: bovine serum albumin; AGEs: advanced glycation end products;* p < 0.05; ** p < 0.01. From: Serban, A.I. ; Stanca, L.; Geicu, O.I. ; Dinischiotu, A.
AGEs-Induced IL-6 Synthesis Precedes RAGE Up-Regulation in HEK 293 Cells: An Alternative Inflammatory Mechanism? Int. J. Mol. Sci. 2015, 16, 20100-20117. Sheep anti NFκB antibody (VPA00015) used for the evaluation of NFκB expression in normal human skin derived fibroblasts by western blotting. AGEs induced signaling in CCD 1070SK fibroblasts. p-ERK1/2 and NF-κB p65 protein expression levels (a) Representative immunoblot membranes; (b) Combined densitometry data indicating fold changes in the protein expression of p-ERK1/2 (b) and NF-κB p65 (c). Immunoreactive bands were normalized to the total proteins transferred onto the membrane in the corresponding lane. Data are relative to BSA and nonimmune IgG treated cells. BSA: bovine serum albumin; AGEs: advanced glycation end products; * p < 0.05; ** p < 0.01; *** p < 0.001. RAGE and TGF-β1 Cross-Talk Regulate Extracellular Matrix Turnover and Cytokine Synthesis in AGEs Exposed Fibroblast Cells. NFkB p65 antibody recognizes transcription factor p65, also known as nuclear factor NF-kappa-B p65 subunit or nuclear factor of kappa light polypeptide gene enhancer in B-cells 3. The antibody has been extensively validated for western blotting using whole cell lysates. Sheep anti Human NFkB p65 antibody recognizes human full length human p65 (NFkB), also known as transcription factor p65 or nuclear factor of kappa light polypeptide gene enhancer in B-cells 3. Human NFkB p65 is a 551 amino acid pleiotropic transcription factor containing a single RHD domain. Sheep anti Human NFkB p65 antibody will also detect proteolytic fragments of NFkB p65 containing the DNA binding RHD domain located in the amino-terminal region. Multiple isoforms of NFkB p65 are generated by alternative splicing. Sheep anti Human NFkB p65 antibody binds to isoforms 1 and 2 containing the intact RHD domain, but it is unclear whether it will bind to isoforms 3 and 4 which have partial differing deletions within the RHD domain. 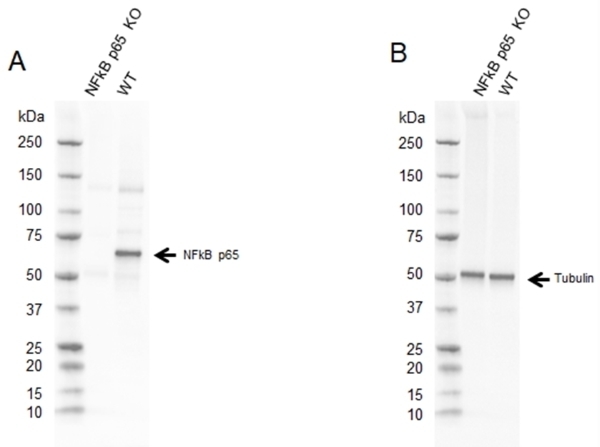 Sheep anti Human NFkB p65 antibody recognizes human NFkB p65 as a single band of ~65 kDa in HEK293 cell line lysates by western blotting under reducing conditions. It also cross reacts with rodent cell line lysates tested. 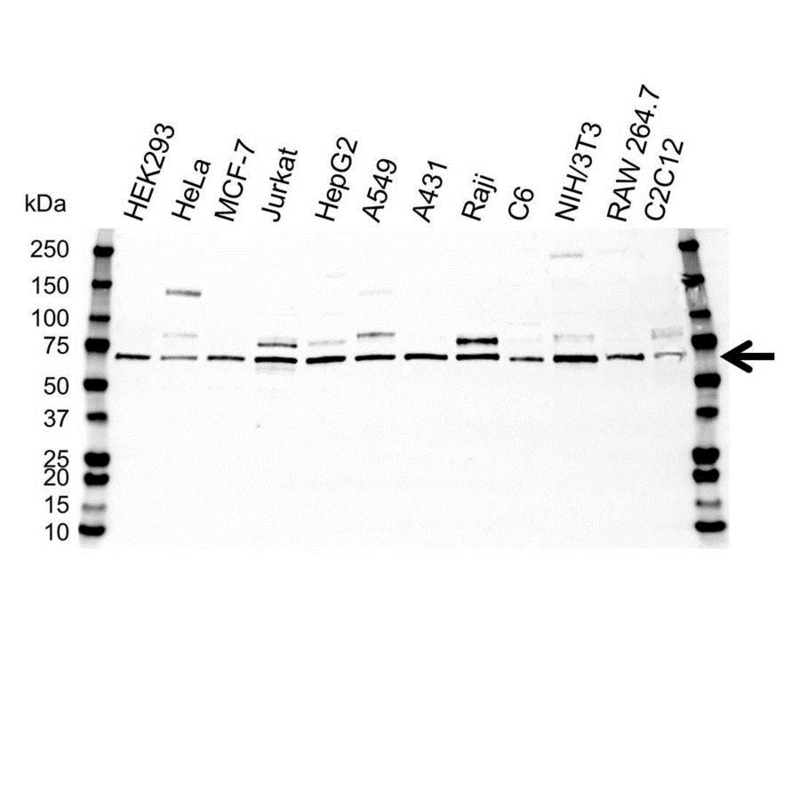 Anti NFkB p65 antibody detects a band of approximately 65 kDa in HEK293 cell lysates. Serban, A.I. et al. (2015) AGEs-Induced IL-6 Synthesis Precedes RAGE Up-Regulation in HEK 293 Cells: An Alternative Inflammatory Mechanism? Int J Mol Sci. 16 (9): 20100-17. Serban, A.I. et al. (2016) RAGE and TGF-β1 Cross-Talk Regulate Extracellular Matrix Turnover and Cytokine Synthesis in AGEs Exposed Fibroblast Cells. PLoS One. 11 (3): e0152376.